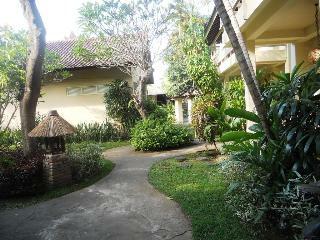 This attractive beach hotel is situated on the famous Lovina beach. Lovina's shopping facilities and restaurants are only a few minutes from the hotel. 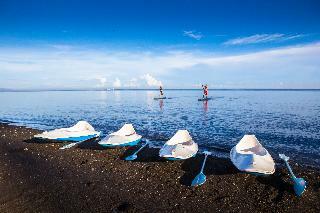 Countless sightseeing attractions of Bali are also within easy reach. Denpasar airport is a 2-hour drive away. Guests are invited to use the hotel's safes, currency exchange counter and cloakroom. Culinary options include a bar and a restaurant. There are several conference rooms for business guests. The hotel also has a small supermarket and a pharmacy. For the younger guests there is a playground. 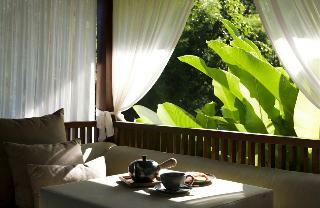 Decorated in a Balinese style, the air-conditioned rooms come with a bathroom, living area with a kitchenette and a terrace. The apartments also comprise a separate bedroom. The well-maintained outdoor complex offers a swimming pool, a poolside snack bar as well as a sun terrace. Main activity is sunrise Dolphin tour every morning from our swimming pool. Nestled in the rolling green hills and rainforest of Bali's north coast, this striking resort offers secluded private villas for a relaxing holiday retreat. The spacious villas are enclosed in lush, tropical gardens and furnished with sleek hardwood furnishings and local antiques. Deluxe villas feature the addition of an open air Jacuzzi, while pool studios and villas come with butler service and lavish infinity pools with magnificent views towards the sea. Guests will delight in the in-house restaurant's Western and Asian fusion cuisine prepared using fresh, local, organic meats and vegetables as well as products from the resort's own small farm. The spa offers private and group yoga classes in addition to a range of massages and beauty treatments for both adults and children, and guests can enjoy Balinese cooking classes, diving, snorkelling and hiking excursions, or golfing at the world-famous Bali Handara Kosaido course. 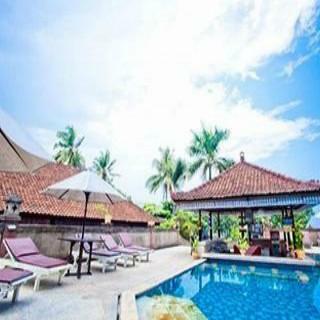 This property is located on the magnificent Lovina Beach, Bali, which is renowned for its beautiful waves and beach. It is only 10 minutes' drive from Singaraja city. Denpasar International Airport is some 3 h drive or approximately 110 km from the establishment.This property welcomes guests to enjoy the beautiful garden hotel with traditionally styled Balinese bungalows. In addition to a lobby area with a hotel safe and currency exchange facilities, amenities available to guests at this 30-room beach hotel include a bar, restaurant and room and laundry services (the former for a fee). Guests arriving by car may use the hotel's parking facilities.In addition to air conditioning units or a fan, in-room amenities include hot water, a minibar and a TV. Accommodation units also come with a private bathroom with a bathtub/shower, and other amenities available to guests include a safe and a balcony/terrace.Guests are invited to enjoy a swim in the hotel's crystal-clear pool with children's section. They can also go snorkelling, sailing or dolphin watching, far away from peddlers and souvenir sellers. Guests can also enjoy a game of tennis.The restaurant offers a wide range of European, Chinese and Indonesian cuisine in a wonderful relaxed atmosphere. Situated directly on Lovina Beach on Bali's northern coast, this resort offers a relaxing holiday of sea and sun as well as cultural and spiritual discovery. The area boasts numerous temples such as Beji Temple, Ponjok Batu Temple and Pulaki Temple. Singaraja is only a fifteen-minute drive away, and guests might wish to go snorkelling at the beach, trekking in the area's lush tropical forests or cycling through the rolling green hills and verdant rice patties.The resort's spacious, air-conditioned rooms and villas all come with a balcony or terrace with garden or pool views. The 24-hour restaurant and bar serves rich Indonesian specialties as well as Chinese and European cuisines, while the onsite spa offers Balinese massages, Lulur baths, and aromatherapy treatments. This resort's spectacular seaside location, comfortable rooms and great services make it the perfect choice for a holiday in Bali. 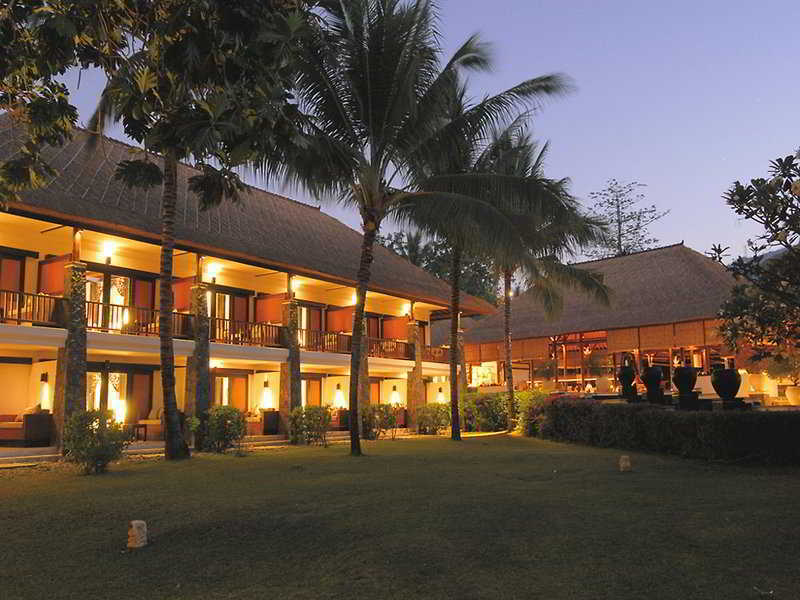 This charming luxury hotel enjoys a wonderful location right by Lovina beach. The historical centre of Singaraja is around 6 km away, where shopping venues, cafés and restaurants are to be found. 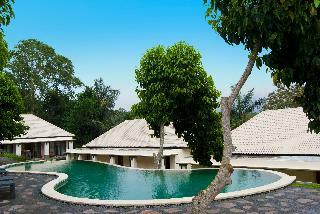 The hotel is also 3 hours' drive from Ngurah Rai International Airport. This pretty hotel offers a lobby with a reception desk, safes and currency exchange desk. Further facilities include a café, a cosy bar and 2 beach restaurants. The rooms are designed in Balinese style and include a bathroom with a hairdryer, a direct dial telephone and satellite/ cable TV. Each room also features a minibar, individually regulated air conditioning and a hire safe. From the terrace, guests are offered a stunning view of the colourful flowers in the garden and the clear sea. There is a swimming pool in the exotic, well-maintained outdoor complex as well as a pool bar, sun loungers and parasols. 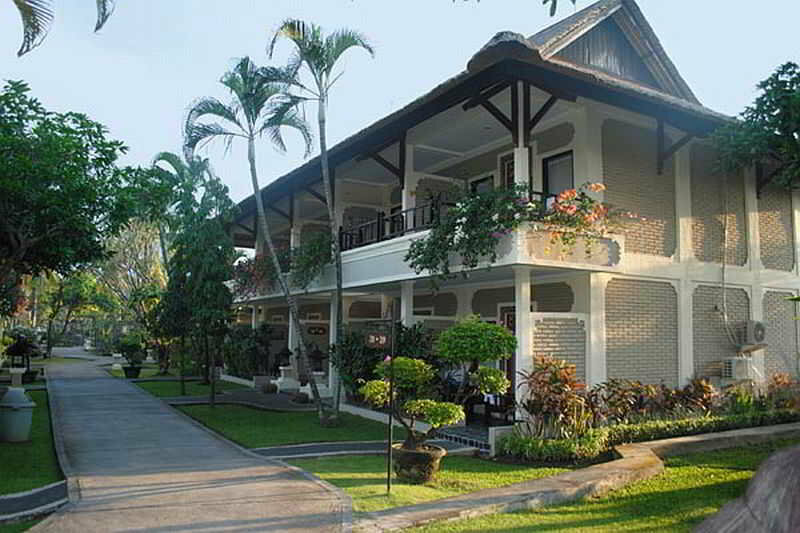 The hotel is located in Lovina Beach, Bali, is a popular choice for travelers. Only 99. Km away, this hotel can be easily accessed from the airport. Visitors to the hotel can take pleasure in touring the city's top attractions: Lovina Beach, Yudha Mandala Tama Monument.The facilities and services provided ensure a pleasant stay for guests. For the comfort and convenience of guests, the hotel offers Wi-Fi in public areas, family room, shops, safety deposit boxes, salon.All guest accommodations feature thoughtful amenities to ensure an unparalleled sense of comfort. The hotel's recreational facilities, which include water sports (non-motorized), private beach, outdoor pool, garden, pool (kids) are designed for escape and relaxation. 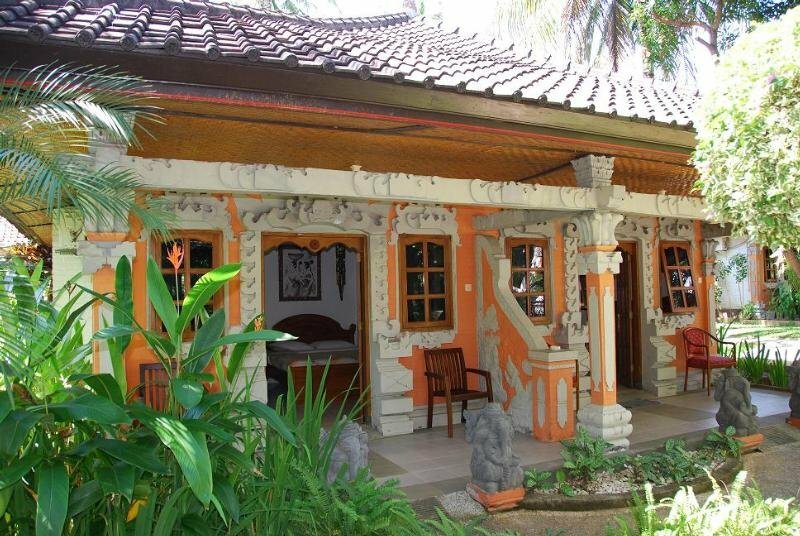 This family-friendly establishment is located in the idyllic Bali, in Kalibukbuk, just a 5-minute walk from the beach and 10 kilometres from Singaraja, a town in northern Bali. International Ngurah Rai Airport, in Denpasar (South Bali) is about 3 hours' drive from this hotel. Boasting a very interesting animal theme park where guests can swim with dolphins, this property is the perfect place for those nature lovers who wish a comfortable accommodation in a harmonious setting. 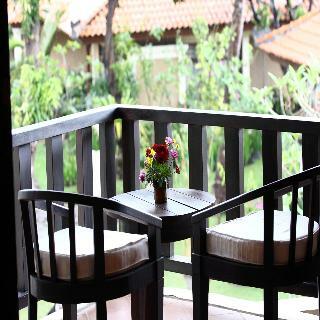 All the rooms have been tastefully decorated in a Balinese style, featuring wood furnishings and air conditioning. As for the facilities, 3 fresh water pools and 3 salt water pools with dolphin attraction will make guests enjoy a unique experience. The state-of-the-art spa offers a wide choice of beauty treatments under the full supervision of experienced staff. Meals can be enjoyed at 3 restaurants on-site and drinks are served at 3 bars. Located in the beautiful village of Tembok, a cluster of traditional houses on the pristine northern part of the island, allows this resort to combines the therapeutic value of its beautiful location with an ancient and rich cultural heritage. It lies approximately 2 hours' drive from Bali International Airport and this distance makes it a true haven of calmness and tranquillity. Guests are invited to relax at any of the 7 onsite treatment rooms, each reflecting a different aspect of magical Bali, where they are attended to by expert therapists trained in the ancient arts of Balinese massage. After an invigorating massage they can head to the swimming pool. Set adjacent to the beach and surrounded by majestic palm trees, is the large midnight blue infinity pool where cool waters blend seamlessly with views of the ocean and the clear Balinese sky to create a truly magical atmosphere. Guests wake up in paradise everyday with views that can only be seen to be believed. The hotel has 7 different accommodation types to choose from, ranging in size and price from modest right up to grand. The hotel is located on the northern shores of the Indonesian island of Bali, away from the typical tourist hustle and bustle of Kuta and Seminyak. In Bali, it is an untouched paradise that can be described as Bali's ‘hidden gem', boasting quaint fishing villages, serene beach scenery, lush greenery and resort accommodation. Set in 18 hectares in central Bali, the eco-friendly property nurtures and supports the natural offerings of the land and environment whilst maintaining the lavish experience your break deserves. The inspiration of this property comes from the “Tri Hita Karana”, meaning harmony with people, harmony with God and harmony with nature - an ancient Balinese philosophy the family of the Bagus Discovery Group firmly holds onto.More than 17 hectares are used strictly for organic farming and manufacturing, providing a variety of healthy and organic foods such as fruits and vegetables which are sold throughout Bali, and you can also enjoy during your stay. The site caters to those wanting a private experience in one of our 10 Superior Farm Rooms, our 20 country-style Deluxe Farm Rooms and 16 Luxury Farm Villas surrounding the swimming pool and 2 Two-Bedroom Pool Villas.